during these winter days and love working with these gorgeous dies purchased at The Rubber Buggy that carries name brand dies, stamps and other crafting supplies. I thought of making this card for someone who is suffering from cancer and will have this card with gorgeous hand made flowers next to her bed. Also, this card would be used for a sympathy card. NUVO Crystal Drops – Dandelion Yellow in the center of each lily. card stock and cut using the oval die. 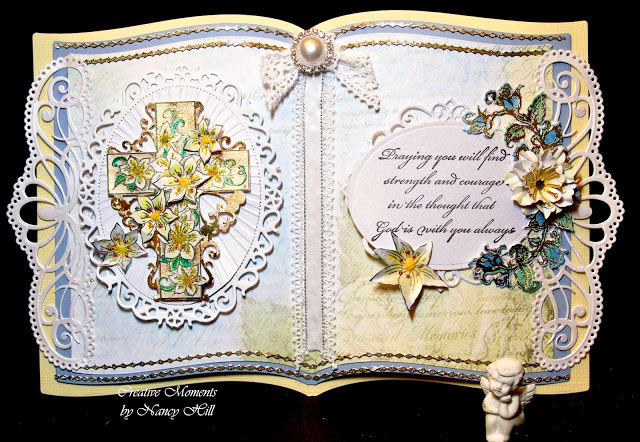 Adhere to the Raindrop on Roses die cut and adhere to card. strips to the top and bottom of the first two book pages. rose-colored card stock and die cut. Adhere this sentiment to the inside of the card. WOW! Let me catch my breath! Just GORGEOUS!